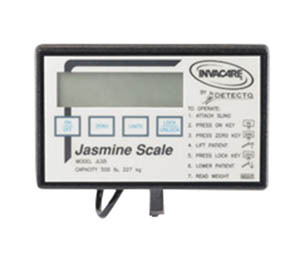 This patient scale can be used with Jasmine lifts. It comes with digital display to accurately and easily weigh patients during daily transfers. The Jasmine Scale MUST be installed in the orientation shown in FIGURE 1. Otherwise, injury may occur. On / Off OFF Center of Display Window Pressing this key will apply power to the scale and turn the unit on. When the scale is already on, pressing the button will turn the unit off. Zero Zero Lower Left Corner of the Display Window Pressing this key when the scale is on will reset the weight shown in the display window to zero. Units lb. or kg. Upper Right Corner of the Display Window The function of this key is to change the unit of measurement from pounds (lb) to kilograms (kg). Lock / Unlock Lock Lower Right Corner of the Display Window This key is used to LOCK or UNLOCK a weight value in the display window. NOTE: Weight displayed is a STORED weight and not the current weight when the key is used in the lock position. N/A LO BAT Center of Display Window Indicator is shown in the display window to notify when battery is low. NOTE: If the scale is installed incorrectly, the swivel bar or cradle attachment will not rotate freely, limiting patient movement during transfer. Step 1: Align the holes in the top rubber cap, the holes in the Jasmine scale mounting bracket and the nylon spacers with the holes in the boom mounting bracket. Refer to Detail “A” for hardware orientation. Step 2: Attach the Jasmine scale to the boom mounting bracket with a screw, washer, bearings, flat washer and locknut. Refer to Detail “A” for hardware orientation. NOTE: For this procedure, refer to FIGURE 1, Detail “B”. NOTE: The cradle attachment attaches in the same way that the swivel bar attaches to the Jasmine Scale. 1. Put the washers on the swivel bar pin. 2. Insert the swivel bar pin through the swivel bar. 3. Align the holes in the swivel bar pin with the hole in the bottom of the Jasmine scale mounting bracket. 4. Attach the swivel bar pin to the Jasmine scale with a screw and locknut. Tighten securely. DO NOT operate key strokes with pointed objects (e.g. pencils, pens, fingernails, etc.) Otherwise damage to the key pad will result. NOTE: The display will indicate the last weight that was measured. The word ʺLOCKʺ will be seen in the display box. NOTE: The ZERO key is pressed in order to avoid capturing the weight of the sling and the hardware. If the ZERO key is not pressed the weight of the sling and the weight of the hardware will be included in the weight displayed. NOT ZERO‐ING OUT WILL GIVE A FALSE READING OF THE USERʹS TRUE WEIGHT. A. The scale will reset to zero and the word ʺZEROʺ will appear in the display. B. The lock function will then be turned off and the word ʺLOCKʺ will disappear from the display. NOTE: The scale is now active and continually updating the weight display. 2. Place the patient in the sling. For patient placement instructions refer to Operation in the Jasmine Patient Lift Owner’s Manual, Invacare P/N 1150704. 3. Activate the lift mechanism to raise the patient until they are completely supported by the lift. For patient lifting instructions, refer to Lifting the Patient in the Jasmine Patient Lift Owner’s Manual, Invacare P/N 1150704. 4. Note the weight display. 5. When the weight display becomes stable press the LOCK button to lock the weight display. This will be indicated by the word ʺLOCKʺ appearing in the display window. NOTE: Should it be necessary to unlock the weight while the patient is still supported by the lift, the UNLOCK button may be pressed. The weight will unlock and the word ʺLOCKʺ will disappear from the display window. The weight value will then be updated. Once the weight becomes stable the weight can be locked again by pressing the LOCK button. NOTE: Stable being defined as the weight fluctuating ± two tenths of a pound. For example, a patient weighing one hundred lbs the scale will fluctuate between 99.8 and 100.2 until the LOCK key is pressed. Fluctuation of the weight displayed is normal as noted above. Press the LOCK button to lock the weight. NOTE: The UNITS button can be pressed to toggle between units of pounds and kilograms. This is indicated by lb or kg appearing in the display window. 6. The lift may now be lowered and the sling removed from the patient.